Vincent 'Mad Dog' Coll at a 1931 court appearance. 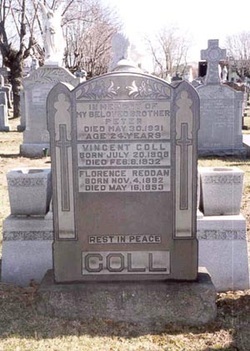 If ever there was a man who symbolized the ruthlessness and violence of organized crime, it was Vincent "Mad Dog " Coll, of the most hated - and feared - men of that era. Born Uinseann Ó Colla on July 20, 1908, in Gweedore, an Irish-speaking region of County Donegal, Coll was a distant relative of Northern Ireland MP Bríd Rodgers. His parents emigrated to the U.S. a year after his birth. Settling in the Bronx, Coll displayed his wild side from an early age, and his impoverished parents allegedly turned him over to an elderly neighbor to raise when they could no longer control him. Expelled from several Catholic schools, he finally left permanently and turned to petty crime. He eventually joined the Gophers, a violent street gang that included a then young and unknown Oweny Madden. It was as a member of the Gophers that Coll came to the attention of rising mobster Dutch Schultz, an equally violent man. The two would become like oil and water, but in the beginning they made a formidable team. 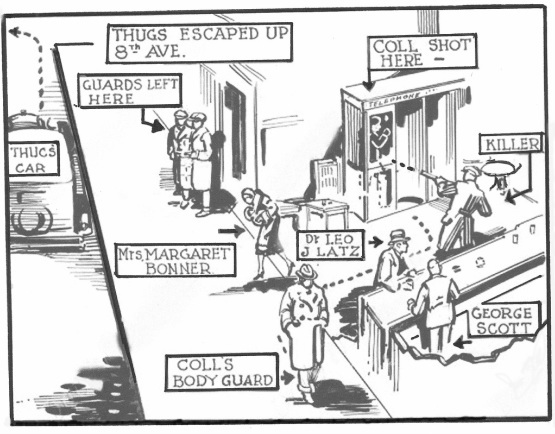 Coll’s violent personality and his willingness to kill on demand made him a valued enforcer to Schultz as he lied, cheated, and killed his way to the top of the New York rackets during the 1920s. Coll quickly became Schultz’ top assassin, but that position also put Coll on law enforcement's radar. In 1927, at age 19, Coll was charged with the murder of a speakeasy owner who refused to sell Schultz’ alcohol. Coll stood trial, but was acquitted due to Schultz’ political influence. The acquittal should have been a lesson to slow down, but it only emboldened Coll's sense of invincibility and importance, and before long even Schultz couldn’t keep him under control. The lines of employer/employee continue to blur when Coll robbed the Sheffield Farms dairy in the Bronx without Schultz’ authorization. Schultz confronted Coll about bringing unnecessary attention to his operation and making moves without permission. Rather than being apologetic, however, Coll reminded Schultz about all he had done to help build Schultz’ empire and demanded to be made an equal partner. Crossing Schultz yet again was a bad mistake. Not only was Schultz more violent than Coll, he was also extremely paranoid and began to view Coll as a potential rival rather than a valued asset. With no friends in the underworld, Coll was now a marked man. In addition to his work for Schultz, Coll also had a lucrative sideline kidnapping gangsters and holding them for a quick ransom. Coll knew the victims would not report the kidnappings because of the underworld's code of silence. As an added measure of security, Coll knew they wouldn't report the crime because victims would have a hard time explaining to the IRS why the large ransoms hadn’t been reported as part of their income. It was easy money for Coll, but Schultz recognized the danger of intentionally antagonizing rival gangs. He tried to tighten his hold on the increasing unstable Coll, but he couldn't hold him for long. The final split between came in early 1931 when Schultz put up bail for Coll after yet another arrest. Coll failed to show up for trial, however, and Schultz forfeited the bail money. When Coll refused to compensate Schultz for his loss, the two went to war, and the blood began to flow. Coll and his wife, Lottie Kreisberger, attempt to avoid the cameras. Coll during his 1931 arraignment. Coll's wife listens in court. 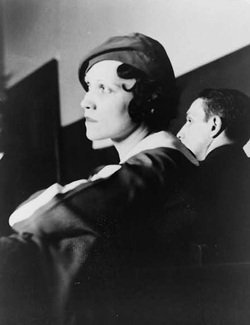 In court with Leibowitz in 1931. Cole continued with his kidnapping sideline and on July 28, 1931, he unsuccessfully attempted to kidnap Joey Rao, a Schultz lieutenant, from a busy street corner. Rao refused to go quietly, guns were drawn and shots were fired. In the end, a five-year-old child, Michael Vengalli, was killed and several other children wounded. Because of this incident, the mayor called Coll a "Mad Dog" and the nickname made for great headlines. Coll was arrested for the killing, and hired famed defense lawyer Samuel Leibowitz to defend him. It was a smart move. Leibowitz managed to destroy the credibility of the prosecution’s main witness, George Brecht, when it was revealed that he made a covert living as a witness at trials. Because of this, Coll was acquitted in December 1931. While awaiting trail on the killing, however, it was business as usual for Coll. In September 1931, Coll was hired by Salvatore Maranzano, New York’s most powerful mobster, to murder his gang rival, Charles "Lucky" Luciano. Luciano had helped Maranzano win the bloody Castellammarese Wars by arranging for the death of Maranzano's rival, Giuseppe "Joe The Boss" Masseria, in April 1931. 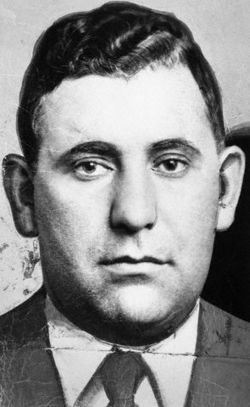 Masseria’s death allowed Maranzano to gain control of organized crime in New York. Luciano had been a trusted member of Masseria’s gang, but offered his services to Maranzano and now Maranzano was concerned Luciano would kill him and take control. Coll agreed to murder Luciano for $50,000, with half paid in advance. On Sept. 10, 1931, Maranzano called Luciano to a meeting at his office. The plan was for Coll to arrive later and kill Luciano during the meeting. However, Luciano had learned of the plot (although probably not the identity of the hitman), so instead of going to the meeting, he sent over some of his own men who stabbed and shot Maranzano to death. It will never be know who was there, but many believe Benjamin "Bugsy" Siegel and Frank Costello were two of the men sent by Luciano. Coll arrived just as Luciano's men were fleeing the scene. Where Coll made his last phone call. It’s entirely possible Coll did see the assassins leaving — but more importantly, they saw him. Not trusted by anyone, it's likely Luciano reasoned it was time for Coll to go before he used what he had seen for his personal gain. Within days of the contract being put out, two freelance hitmen, Leonard Scarnici and Anthony Fabrizzo, accepted Madden’s bounty and went hunting for Coll. On Feb. 1, 1932, Scarnici and Fabrizzo, acting on a tip, invaded a Bronx apartment were Coll was expected to be hidding. The hitmen, not knowing Coll by sight, burst in with machine guns blazing. Three people were killed and three others wounded, but Coll was not among them. He had been delayed and arrived shortly after the shooting. The continued bloodshed was bringing unwanted attention and Shultz and the others had had enough and wanted the matter settled once and for all. A few days later, Coll received word that Madden, whom he trusted from his Gopher days, wanted to speak with him. Coll was told Madden had worked out a settlement between all the gangs that would make everyone happy. Coll was told to go to a certain location in Hell's Kitchen where he would be safe because the neighborhood was under Madden's protection. This time there would be no mistake. Schultz sent Abraham "Bo" Weinberg with Scarnici and Fabrizzo to identify Coll since Weinberg and Coll had worked together under Schultz. At about 12:30 a.m. on Feb. 8, Coll entered the phone booth in the London Chemists drug store at 314 W23rd Street at Eighth Avenue, and placed a call to Madden. Weinberg and the killers were parked outside and watched Coll enter the drug store and, once on the phone, Weinberg pulled up in front of the store and Scarnici and Fabrizzo stepped out. Fabrizzo (and some witnesses say at least one other) waited on the sidewalk while Scarnici went inside. According to police reports, as Scarnici passed cashier George Scott, who was waiting on a customer, Dr. Leo Katz, he turned to Scott and quietly said, "Keep cool now." 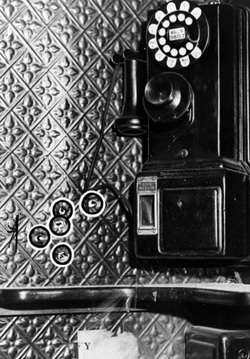 Stepping up to the phone booth, Scarnici drew a submachine gun from under his overcoat and fired two bursts, one long one and a second, shorter one, as Coll was talking to Madden. Scott said Scarnici stood looking at Coll for a second and as spent shell casings slowly rolled off a nearby counter and echoed on the tile floor, Scarnici replaced the gun under his winter overcoat and he walked toward the door. As he passed Scott and Katz, he glanced at them and raised a finger to his lips in a shhhh motion. He quietly exited the store and stepped into the back seat of a waiting car which immediately pulled into Eighth Avenue traffic and faded into the winter darkness. The entire incident lasted less than a minute. A total of 15 bullets were removed from Coll’s body at the morgue, but the coroner said it appeared that many more may have passed through him. Schultz sent a wreath to Coll’s funeral bearing a banner with the message, "From the boys." When one of the shooter's bullets allegedly disconnected the call, an operator later claimed to have called Madden back and asked if he wanted to be reconnected. "No," said Madden. "My party got the message." Shattered glass in the phone booth door shows where the bullets entered. Vincent Coll during the good years. A graphic of the crime scene that appeared in the newspapers the following morning. The three men involved in Coll’s murder also met with violent deaths. On Nov. 20, 1932, Fabrizzo was murdered after a botched attempt on the life of "Bugsy" Siegel. On June 27, 1935, Scarnici was electrocuted at Sing Sing for the 1933 murder of a detective. Before his execution, Scarnici confessed to 14 murders, including Coll’s. Weinberg vanished without a trace on Sept. 9, 1935, presumably killed by Schultz for having conspired against him with Luciano. Dutch would continue to operate his rackets for only a few more years. On Oct. 23, 1935, Schultz was killed at the Palace Chophouse in Newark, N.J., on orders from the newly-formed National Crime Syndicate after he vowed to kill New York District Attorney Thomas E. Dewey. The DA had promised a crackdown on crime and had made Schultz his first target. The syndicate rightly reasoned killing Dewey would bring too much attention, but Schultz refused to abide by the decision, so he had to go. In 1935, Owney Madden, still under police scrutiny for the Coll killing, moved to Arkansas where he opened a hotel and resort. Over the years, many mobsters, including Luciano, vacationed there. Madded died of natural causes in 1965. Coll's body is removed form the drug store. At right is Coll's grave. Coll's funeral, looking like a scene from an Igmar Bergman film, was attended by only his wife, sister and a few friends. The funeral was on a cold, rainy day. The cemetery is on East Tremont Avenue in the Bronx.